Home » Bozeman Montana Real Estate Blog » Featured » Buy, Remodel or Build? Part One. Buy, Remodel or Build? Part One. Some decisions in life are easy and relatively painless. There are people who fall in love at first sight, others who know from childhood exactly what they wish to pursue as a career, and still others who see possibilities while their friends and families note barriers and caution there are extreme challenges. We constantly make choices, weighing our total cost attributed to time, energy, risk, and money against our reward in terms of satisfaction, utilization, and advancing the quality of our life. One of the greatest decisions faced by today’s real estate buyer is: Will I find my dream home, is it viable to purchase and remodel a home to better suit my needs, or should I buy vacant land and build? Part One we will provide a broad stroke overview. In October’s Part Two, we will explore remodeling and building in depth. There are few things more intensely personal than seeking your next home. If you have a significant other and/or family and pets, the complexity of agreeing that a property is the right one is multiplied. Yes, there are times when a buyer views a home and announces, “This is it! Perfect.” But that’s a rarity. It usually takes two or three visits to a home or site just to absorb the offering and weigh it in relationship to all the variables. Home is important and deserves serious considerations. As Realtors in the Gallatin Valley, Bozeman, Montana, we constantly engage in the process of introducing and showing potential buyers a number of existing homes that meet many on their “want” list. Generally, it begins with the buyer contacting us either through a phone call or email. During our initial dialog, we address the basics: What are they picturing? What will be the home’s primary use and function? Who will be living there and who will visit? What features are important? What type of location and view interests them? What’s the time frame and budget? Frequently, a new client will have a list of homes drawn from MLS and internet searches that interest them. Prior to their arriving in Bozeman to tour properties, we will have refined the search so as to make the best use of their time. Inventory levels for existing quality, high-end homes in the Gallatin Valley are low. 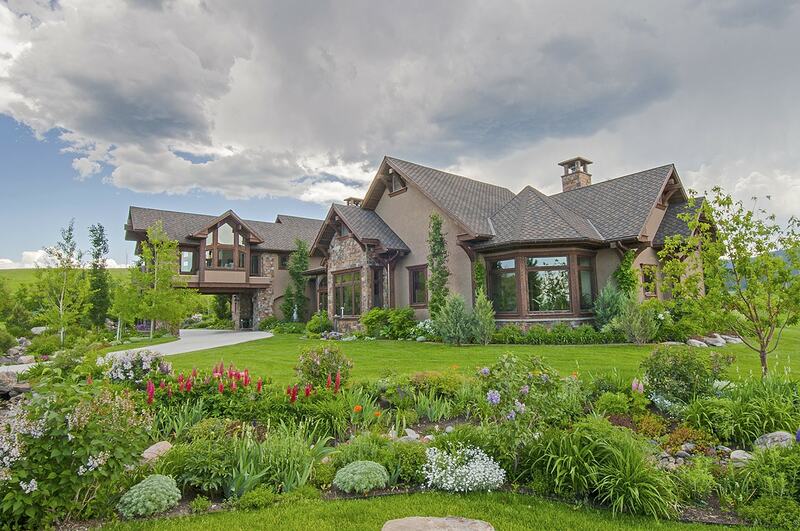 There are 88 homes currently listed in the Bozeman area priced at $1 Million and above. There are 30 priced over $2 Million. The more specific the buyer’s requirements, the faster the potential pool dwindles. Insisting on live water within a 15 minute drive of Bozeman decreases the potential properties to a handful. The buyer being specific about the desired levels of finishes and “dating of a home,” floor plan, and home’s style further limit choices, especially in a small community such as Bozeman. Many homes for re-sell here are custom built for the original owner and their specific needs. In less than a decade, tastes have changed. In Montana, great rooms, smaller footprints, energy efficiency, outdoor entertaining spaces, main floor master suites, and open floor plans are on just about every buyer’s list, along with views, privacy, close to town, and live water. Increasingly, buyers are faced with the big question: Do I settle for an existing home that has some, but not all, of the features I am seeking, do I undertake a remodel, or do I find land and build? Buying an existing home is a fairly “known” type of transaction. High-end existing homes tend to be priced on an average of 20% or more below the cost of building. You are able to physically walk through and view the property as it exists. There is an asking price that your Realtor negotiates for you. You know how much you are paying per square foot for the home. You have multitudes of inspections available to you to determine if there are any detectable defects or maintenance issues and then your Realtor can negotiate with the seller as to who is financially responsible for repairs. There is a stated date of closing and when you can occupy the property. You have the opportunity to live in the house and enjoy it before you decide whether to do any remodeling. It is all very straight-forward. You are knowingly accepting the home’s condition as well as its location–the home has a definite site. Remodeling can completely transform a home and make it fresh, modern, and perfectly suited to your lifestyle. Remodeling is very appealing when a home is located on desirable property and you know that with some “tweaking” you will have the home of your dreams. However, remodeling can posse many challenges, beginning with the difficulty of knowing an exact cost and time frame. Whether you are remodeling or building, estimates of cost have varying and shifting levels of accuracy. With detailed architectural plans, chosen material and finish levels, and a reliable builder, you feel fairly comfortable with a written bid for a job. However, any change orders, unforeseen or unpredictable disasters/catastrophes or delays affect the price. In remodeling, what initially seems simple oftentimes becomes far more involved. The clichéd saying, “As long as the workman are here…” can lead to larger expenditures than anticipated. Remodeling that involves primarily surface finishes such as counter tops and replacing flooring is far more predictable than moving walls, heightening ceilings, adding on a bedroom, changing the floor configuration, and completely redoing a kitchen. Complexity–which translates to cost–increases due to the age and framing of the existing home, the scope of the project, and many other factors such as timing, materials desired, and faulty or outdated infra-structure that is only discovered during the actual renovations. In Bozeman, where vacant land is scarce, remodeling is becoming a more common occurrence. If you are viewing potential homes and find one that you feel requires a remodel, it is best to have a builder walk through the home with you and get a quick “guesstimate” of the costs and time requirements prior to making an initial offer on the property. This rough estimate will help you determine what you are willing to offer for the property. The builder should be able to give you a high-low price range based on the home’s construction, age, and what you are initially thinking you’d want to do. He can alert you if there are limitations or situations that will add to the cost. For instance, you may want to tear down a wall and open up a space. In one instance, it’s a sheet rock wall and involves little expertise or time. In another home it is a load bearing wall with major conduits for plumbing and electric. You need expertise to identify the variables given the existing home’s condition. If you are comfortable with the initial “guesstimates,” you’ll want to consider having your Realtor write a special provision during a due diligence time period for you to get a firmer grasp on the cost and time involved in the remodel. It can take a few weeks to determine that your plans fall within any zoning, covenants, and build guidelines of the home’s location. You’ll want to have an architect and builder solidify what is involved. Then, you’ll want to add these costs along with a cushion for over-runs onto the cost of the home and determine if, when all is said and done, you are going to have paid an acceptable sum for the finished home. Is it a viable investment? Will the home be livable and will it be marketable if you should have to sell it with a few years? Building your own home is an adventure that will take approximately 2 years from the time you close on a piece of land to when you actually move into the home. It’s exciting, engaging, creative, and a real opportunity to live in a home tailored to all your needs and wants. In today’s market, you can figure you will pay a premium for building. It is a serious undertaking, even for those who have previous experience combined with a terrific architect and builder. Many people assume that building a home automatically results in “perfection.” Nearly everyone who has ever gone through the process of having their home designed and built has a list of things they’d change after the fact. “If I’d only known…” Or, “I wish I had…” There is a satisfaction, though, that is unlike any other. Building is a co-operative, creative process beginning with the actual land and build site, then involving the architect, engineer, general contractor and all the sub-contractors he works with, the landscaper, and the homeowner, who pays for it all. Costs can quickly escalate. Time can drag out. You will need to pay attention and be willing to spend hours making multiples of decisions ranging from faucets to where light switches are placed. Generally, the cost of the vacant land is approximately 20% to 25% of the total cost of the build. Architectural fess run 12% to 15% of the build costs. Landscaping is generally budgeted at around 10% of the build costs, but quickly increases if water features or extensive gardens and out buildings are involved. Numerous unexpected items eat into the budget, such as permit fees, or, in the Bozeman area, wells and costs to run power and roads to the site. When the entire project is finished, all of these costs are factored into determining actual cost per square foot. Properties listed on MLS do not separate out the land costs, so when a home is listed as costing $300 per square foot it may be sited on a half acre or 160 acres. You can build a “high-end” home in Bozeman, without the land cost factored in, for anywhere from $200 on up. In today’s market, $1 Million to $ 2 Million homes on MLS with land factored in generally priced are in the $260 to $350 per sq. foot range while homes $3 Million and above are in the $550 to $760 range. These luxury homes tend to have both more acreage and more “bells and whistles” such as expensive sound and lighting systems. When considering a new home—whether buying a dream home, buying with the intention of remodeling, or deciding to build, the initial most important decision is hiring the right Realtor. At Platinum Properties, we have years of experience in buying and selling high-end homes and vacant land. Mike Schlauch was actively engaged in the construction business for 30 years, while Sally Uhlmann remodeled and built a number of homes. We know the current market inventory, the value and proper cost of land and building, and the resources to help you achieve your objective. We will counsel and guide you through the process of buying, remodeling, or building so that it is as stress free and rewarding as possible for you. Great post to read here. Comments Off on Buy, Remodel or Build? Part One.